Click on your USDA zone from the list below to search our catalog for plants that may be suitable for growing outdoors in your climate zone. If you don't know your USDA zone, click to find your USDA zone by zipcode. The hardiness zone search finds tropical fruits, ornamentals and temperate perennials. Vegetables and herbs are not included in the search as they are annuals. 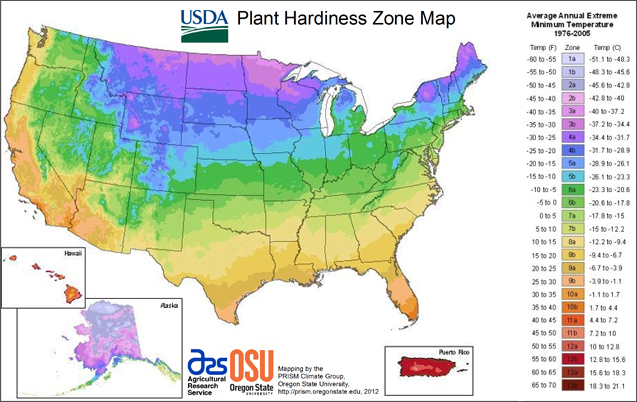 Please note that classification by hardiness zones is estimated and is not exact. Local micro-climates can play a signifigant role in plant hardiness. In addition, rainfall, humidty, sunlight, duration of sub-freezing temperatures as well as other factors impact plant growth. Other variances include plants which may suffer foliage damage at temperatures near freezing but are ultimately hardy to several degrees lower. Certain plants may fall under the same hardiness zone minimum even though there are noticable differences in ultimate hardiness. These results can be used as a general guideline but absolute hardiness will vary. Also, quite a few plants can be succesfully grown in containers, kept outdoors for warmer months and overwintered with protection.